We are a market leader in distribution of these products which includes a blue medium density polyethylene water pipe system suitable for potable (drinking) water distribution. 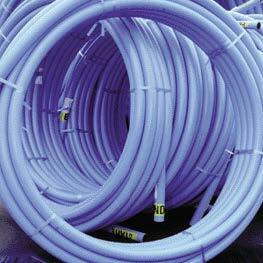 Gas Pipe PE 80 medium density yellow pipe is available for below ground use for gas distribution. Polyethylene (PE) has a number of significant advantages over the traditional materials such as steel or ductile iron. These include lower weight, freedom from corrosion, and the ability to coil long lengths of pipe. Barrier pipe for below ground use for conveying potable water in brownfield / contaminated sites PE 80 (MDPE) with aluminium barrier for contamination protection.